The family decided to go on an August vacation, per Casey's request, to Florida (never again for mom in the summer!). Casey brought her cousin Jamie and Brett brought his buddy Jason. We drove from Miami to Key West, where we had rented a home for most of the week. We were only there a couple of days and were forced to evacuate because of an impending hurricane. But in our few days there, we toured the island, went to the beach, went parasailing and of course, enjoyed the sunset and performers on Mallory Square. Since our Key West vacation was cut short, we returned to Miami and spent the rest of our time there. We enjoyed the beach outside of our hotel, shopping, visiting some of the neighborhoods, such as Little Cuba, and enjoyed an evening at the shops and restaurants along the harbor where the cruise ships pass. In fact, it was there that we ate at our first Bubba Gumps! I particularly remember Casey and Jamie's sheer delight in finding a Sephora (one of Casey's favorite make-up shops) near the Little Cuba neighborhood. Despite the oppressive heat and humidity, we all had a great time! 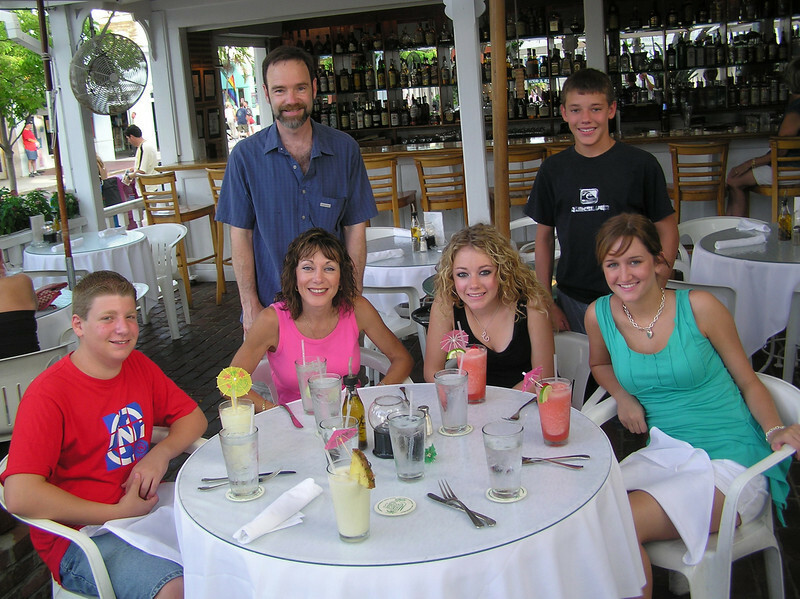 Click the link to read Jamie's amusing memory of her and Casey's antics in Miami unbeknownst to mom and dad! "Florida with Casey (2004) - Pina Coladas Anyone?" Lunch at a restaurant on one of Keys on our way to Key West.